Glove Fans Bid Kid Adieu: Was Ted Williams Wearing This Baseball Mitt When He Walked Away From Fenway In 1960? 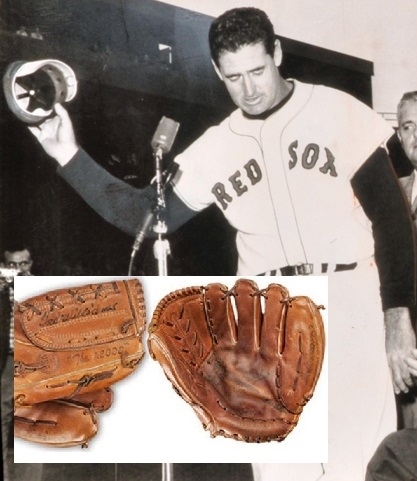 Goldin Auctions sold what PSA/DNA said was Ted Williams' last glove. So wrote John Updike about Ted Williams in the New Yorker on October 22nd, 1960. Now, almost fifty-four years after those words were written, one of the gloves alleged to be Williams’ last was just sold on the auction block. But was it the real deal? And why did one of the experts who authenticated it say he never claimed it was Ted’s last glove when his letter of opinion said it was? Are Goldin Auctions and glove authenticators PSA/DNA just hell-bent for leather? That being said, this is likely the first piece that has paid any attention to Updike’s mention that the “Splendid Splinter” had been giving away his bats and gloves in the weeks leading up to his inevitable retirement. It’s something that caught my eye after Goldin Auctions recently claimed they had the actual sacred relic that Williams pounded his fist into on that late September day in 1960. It was the glove that the “Kid”, himself, would bid adieu to as he hung up his spikes and called it a career. The finality of the day Updike wrote about in 1960 gives this Williams artifact an aura of immortality and the memories of him hitting that homer into the right-field grandstand in his last at-bat just makes this glove all the more noteworthy and iconic. As Americans we seem rather obsessed with the firsts and the lasts of all sorts of endeavors, so when you say, “this is Ted Williams’ last glove,” it resonates with us and seems profound. For auctioneers, having such firsts and lasts in their possession is like issuing themselves a free pass to make the rounds on the network and cable newscasts. If you happen to have that last glove caressing your own hand today in 2014, it’s something that could be extremely valuable. You might even say it would be worthy of a museum display in Cooperstown. Sometime before he passed away, Ted Williams actually donated his 500th home run bat and ball from the 1960 season to the Baseball Hall of Fame and they’ve been on display ever since. Ted’s alleged last glove, however, was up for grabs at Goldin Auctions, but how could they be sure it’s really the one he wore on September 28, 1960? And considering Updike’s mention that Williams had been gifting away his tools of the trade, how could you ever be sure which glove was which? Williams likely used dozens of baseball gloves during his career that spanned from 1939 to 1960, so how could anyone know definitively that one was worn in a particular game, let alone his very last? 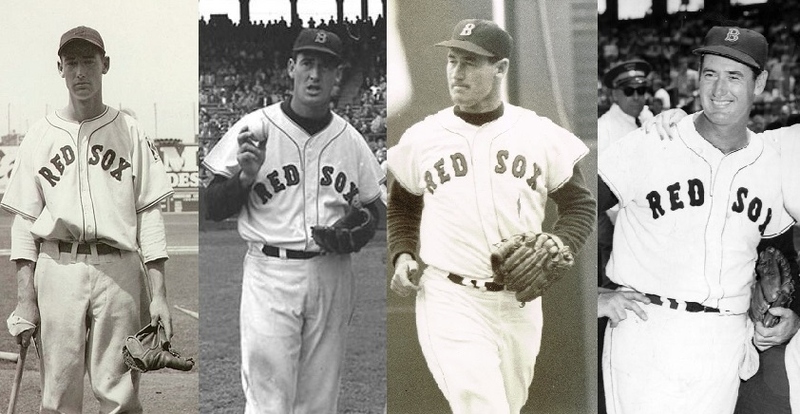 Ted Williams wore many gloves during his career (l to r): Williams in 1939; 1954; undated photo from the 1950s; and on July 4, 1960. Sports Collectors Daily reported that Goldin Auctions received the consignment of Ted Williams' alleged "last glove" from a Red Sox executive. Denny Esken (right) made similar claims that a glove offered by Steiner Sports (center) was "photo-matched" as the last glove Robinson ever wore. But a photo from 1956 (left) reveals that Robinson wore different gloves as evidenced by the "42" he wrote on the strap (see red highlights). It’s not the first time Esken has made a spectacular claim without supporting evidence as he did the same thing last year when he authenticated what he claimed was Jackie Robinson’s last glove from 1956 (and the glove he wore during the 1955 and 1956 World Series). Esken claimed to have “photo-matched” Robinson’s glove from an image taken during Spring Training in 1956, but that didn’t prove Robinson wore the glove in his last game or in the World Series and, as it turned out, the glove he authenticated was not a “photo-match.” It was a different glove. Despite PSA/DNA's claims that Williams' glove was a Wilson A-2000, this photo from July 4, 1960, shows Williams wearing another glove with a different heel construction. The glove depicted in the Boston Globe photo shows close to nine metal eyelits whereas the Goldin glove has only six. In a report published in the summer of 2012, Hauls of Shame presented several photos of Jackie Robinson during the 1956 season and during spring training that clearly showed him wearing a glove different from the Esken authenticated glove that was offered by Steiner Sports. Despite Esken’s false claim, Steiner went on to sell the glove for over $373,000 without posting an addendum reflecting the misrepresentation of the glove to bidders. As was the case with the Robinson glove, we also found a few photographs of Ted Williams wearing different gloves during the 1960 season. The first photo we encountered appeared in the Boston Globe from a Red Sox game played on July 4, 1960, and clearly illustrated Williams wearing a different model glove. The heel construction in the Globe photo showed at least nine different metal eyelets for lacing while the Goldin auction glove featured approximately six. This AP photo from July 9, 1960, (top left) shows Williams wearing a different glove with a rectangular label contrasting with the oval Wilson logo alleged to have been Williams' last (bottom right). An undated Wilson A-2000 glove ad from Williams' personal scrapbooks c1959-60 (top right) shows his glove as different from the Goldin lot. Also pictured is a 1961 Wilson ad for the A-2000 (bottom left). In addition, a second photograph we located was published by the Associated Press on July 9, 1960, and showed Williams posing with Roger Maris wearing a different glove which appeared to have been manufactured by Spalding. The glove was constructed with a rectangular label sewn onto the strap as opposed to the circular stitched “Wilson” logo which is visible on the strap of the Goldin glove. Goldin and Eskin give the impression that the “344A” pro code was a specific designation for Williams, but others say it represents the code Wilson used for gloves made for MLB players in general. Heritage has sold two other gloves said to be "game used" by Ted Williams (l to r) a c. 1955 glove given to a Williams friend and another from the 1950s attributed to Williams. A third glove resides at the Hall of Fame in Cooperstown. A Wilson ad from 1956 shows that Williams used Wilson products. John Updike (right) likely read that Williams was giving away his bats and gloves in a Boston Herald article (right) published the day after his last game on September 28, 1960 (ticket, center). So, what could Goldin or PSA/DNA provide that would somehow support their lofty claims and present the lot description as something that was supported by actual evidence? 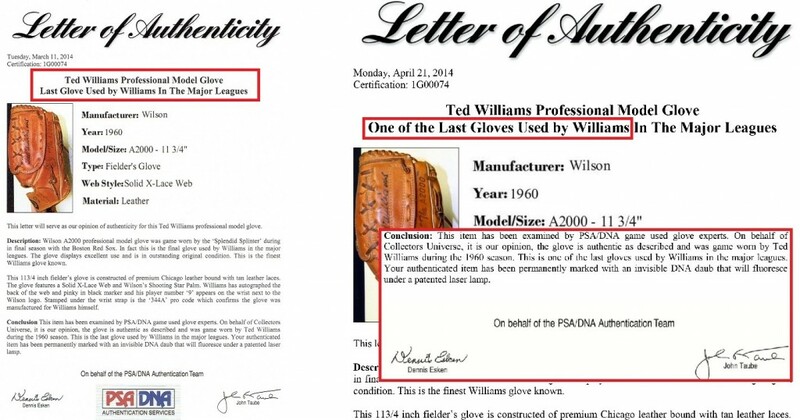 What could separate this alleged glove from other outright frauds that hobbyists have been deceived by recently like the “Shoeless” Joe Jackson “game used” bat offered for sale at Robert Edward Auctions with a fraudulent letter of opinion by PSA/DNA? PSA/DNA replaced its original opinion of this glove's "game-use" in Ted Williams' last game to his "last season" based on information Hauls of Shame passed along to auctioneer Ken Goldin. Based on the track record of the PSA experts Esken and Taube, however, was this downgrade of the letter of opinion from “game use” in Williams’ last game to just his “last season” credible? According to the website VintageBaseball GloveForum.com, the Wilson A-2000 model glove featured a rectangular logo on the wrist strap up until at least 1963 and the round “W” logo appeared circa 1964, almost four years after Williams’ last game. If that information is correct, that would mean it was impossible for the Goldin glove to have been used by Williams in his last season or at any other time in his baseball career. It would mean that the opinion of “game use” rendered by Taube and Esken of PSA/DNA was entirely wrong. What type of research did PSA/DNA conduct to determine the glove was genuine? The PSA website includes an online feature called “PSA Card Facts” which lets users view hi-resolution scans of every Topps baseball card ever issued since 1951, including Williams’ last season in 1960. The players posing for those cards sometimes wore their gloves and in some cases revealed the actual brand of glove they chose to use on the ball field. We decided to scan all of the cards issued from 1960 to 1967 to determine when the Wilson A-2000 glove (which was first introduced in 1957) changed its logo on the wrist from a rectangular shape saying “Wilson” to the oval “W” logo. The results of this review were quite remarkable. PSA Card Facts shows that in Topps cards issued from 1960 through 1964, the oval Wilson logo "W" doesn't appear until 1964 on the card of Wes Stock. All Wilson glove appearing on cards before 1964 have the rectangular "Wilson" logo affixed to the wrist strap. According to the photographs used by Topps on its card products in the 1960’s, the first time a Wilson glove appears with an oval “W” logo is in 1964 on the baseball card of pitcher Wes Stock of the Baltimore Orioles. Topps would use photos of players taken in the previous season or during Spring Training of the year of issue, so the photo of Stock wearing the Wilson glove with the oval “W” logo could have been taken as early as 1963. If the Topps photos are an accurate representation of how Wilson introduced the new style of “W” logo into the Major Leagues, that would again make it impossible for the Goldin Williams glove to have been used in a game during the 1960 season. It isn’t until the seasons of 1965 and 1966 that the oval “W” logo appears with great frequency in the player photographs published by Topps. The Topps cards of Red Sox pitcher Jack Lamabe illustrate best how Wilson introduced the oval "W" logo on its glove products. In his 1963 and 1964 cards he is wearing gloves with rectangular logos and in 1965 and 1966 the logo has changed to the oval "W" version. Reviewing the Topps cards from this era on the PSA website also helped to establish the progression of Wilson products in reference to particular players, including Boston Red Sox pitcher Jack Lamabe. Lamabe is shown in his 1963 and 1964 cards wearing a Wilson glove with a rectangular logo on the strap while his cards from 1965 and 1966 show him wearing a Wilson A-2000 glove featuring the oval “W” logo just like the Williams glove up for auction. 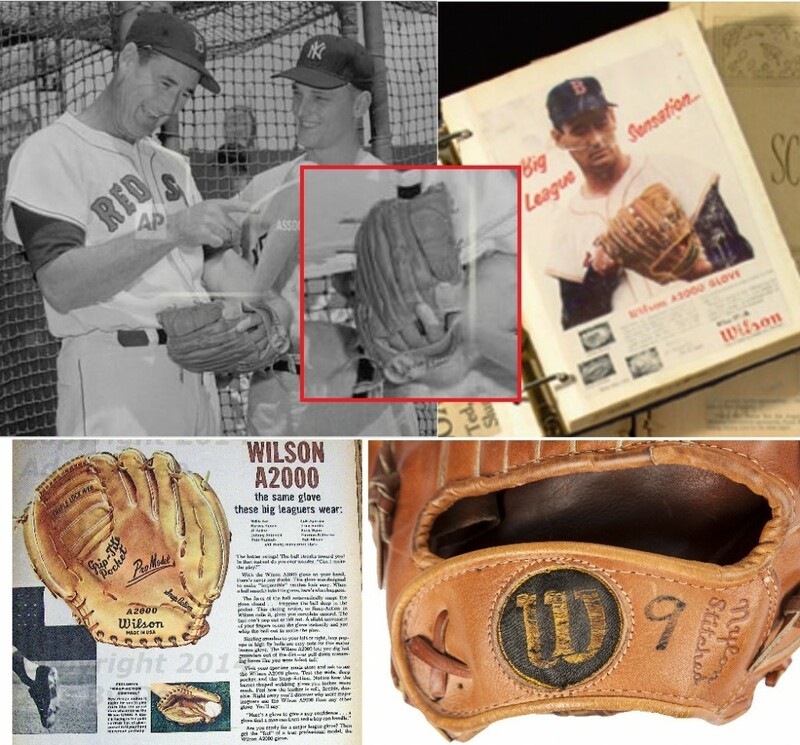 In addition, the Wilson product catalogs do not incorporate the oval “W” logo until the 1964 Spring issue and they continued through the 1960’s including the 1966 catalog which appears to include the exact same model A-2000 glove as the alleged Williams glove (“last game” & “last season”) authenticated by PSA/DNA. Hauls of Shame spoke with PSA/DNA’s glove expert Dennis Esken to make some sense of the Williams glove controversy. When asked how he could justify writing an LOA saying the glove was from Williams last game Esken said, “I never said it was from his last game that wasn’t me. That’s a facsimile signature not mine. I said it was from his last season so that’s how it changed.” When asked who wrote the letter Esken said, “It was John Taube in his office and he really doesn’t know gloves like I do. They want me to look at the gloves coming to PSA because there are so many bad gloves people are trying to get by them,” said Esken. Esken also made a point to say he doesn’t work for PSA for the money but, rather, “to help the FBI” and weed out the bad gloves. Taube did not respond to our inquiry for comment on his PSA/DNA letter. 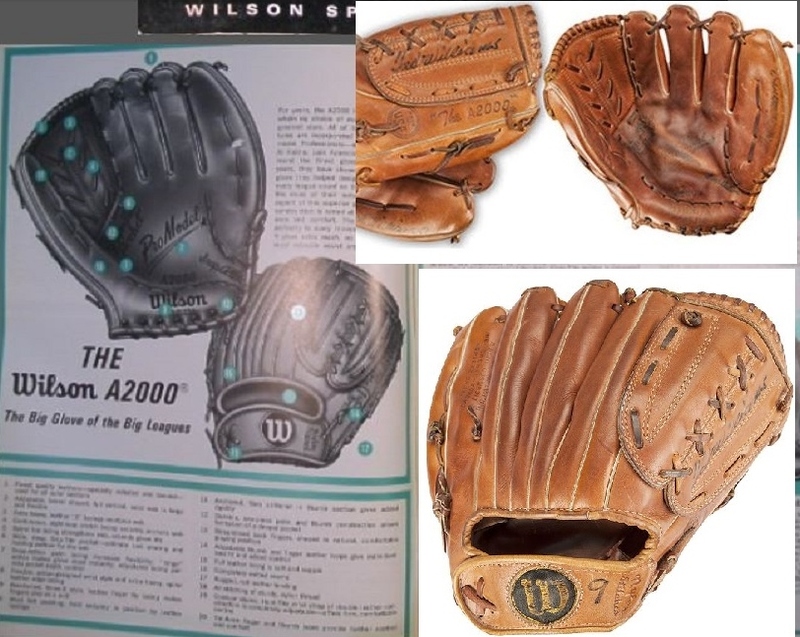 The Ted Williams glove alleged to be from his last season in 1960 is identical to a Wilson A-2000 model that appears in the 1966 Wilson catalog (left). The Goldin Williams A-2000 glove has "344A" stamped on the inside wrist strap (left). Another A-2000 displayed on a collector website has a "241A" stamp. Esken also revealed that the consignor and owner of the glove was Dr. David L. Pressman of Chelsea, Massachusetts, and when asked how he could know which glove Pressman had considering reports of Williams giving glves away Esken said, “I know he was giving away his gloves and Dr. Pressman knew Ted and wanted his last glove and he got it. Donovan got the glove for him from Ted. Donovan hardly had the glove, the Doctor has had it for like 54 years. I found out about the glove from the Doctor over twenty years ago when I checked it out.” Esken added that Pressman couldn’t go to Fenway Park to get the glove that day because he had class in medical school at Harvard and sent Donovan to get that particular glove because it was “the nice one” he wanted as opposed to another glove that he said wasn’t in good shape. Dr. Pressman's Williams glove appeared in a bok written by Bill Nowlin and Jim prime as a "game used" glove with no mention of "last game" or "last season." PSA/DNA authenticator John Taube (center) issued a letter alleging it was from his last game. The company headed by Joe Orlando (right) has since issued a replacement letter alleging game use in 1960. Esken’s hearsay account contradicted Goldin’s description of John Donovan’s acquisition of the glove and, as a result, Goldin told us, “We rely on the consignor as well as the authenticator in instances like the Ted Williams glove where it is not part of an MLB authentication or similar program. Our consignor was a longtime friend of Ted Williams (a point that is without dispute) and has written to us confirming that he received the glove from Donovan on behalf of Ted Williams and was told it was a game used glove from his final season (1960).” Pressman, however, did not provide for Goldin any of the details Esken described. In regard to the glove, Esken’s claims boil down to his own credibility. If you examine Esken’s claim that the current glove in the Goldin auction was a prototype issued to Willliams three to six years before it began appearing on the field with MLB players, you must confront the actual hard evidence that exists in the form of actual photographs of Williams wearing what are clearly two different gloves on July 4th and July 9th, 1960. In addition, you must also confront the existence of the c.1960 Wilson advertisement which shows Williams holding an A-2000 glove with a rectangular logo patch. Wilson A-2000 gloves appeared in catalogs and print ads but were used by some players beforehand. The A-2000 also incorporated several different design elements between 1961 (left) 1964 (center) and 1966 (inset catalog picture). The Goldin Williams glove matches the A-2000 in the 1966 Wilson catalog exactly in construction and graphics. Esken also can’t explain why the alleged “protoptype” glove matches exactly the Wilson A-2000 glove that appears illustrated in the 1966 Wilson catalog. It has been demonstrated that there is a lag-time involved between the time gloves are designed and constructed and when they actually appear in catalogs and print ads. Those gloves also can get into the hands of MLB players well before they are made public and in some cases it has been shown that certain designs could be “game used” even a year before the glove has been made an official model. But the A-2000 model incorporated a host of contrasting design elements from year to year during the time period between 1960 and 1966. 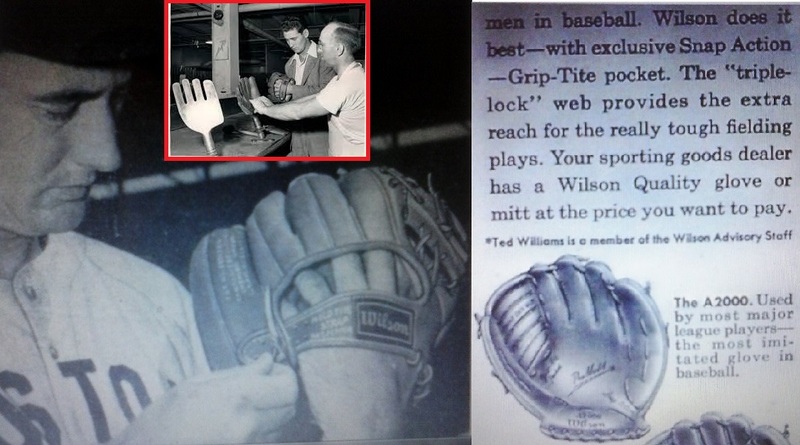 Ted Williams was a member of Wilson's advisory board and had visited the Wilson glove factory early in his career (inset). In 1956 (the season before the A-2000 was introduced), Williams appeared in an ad wearing another Wilson glove model. In another 1959 ad (right) an illustration of the A-2000 was revealed. Would an alleged prototype glove be more likely to resemble gloves that are a year or two removed from a catalog appearance or six years like the alleged Williams glove? And what would be the odds that the Williams glove would match the 1966 glove exactly if they really were separated by six years of designs and improvements? Did it actually take six years for that design to enter the market? Then consider that all of the visual evidence flies in the face of Esken’s claims that the Williams glove was a prototype sent only to him. Based on the story that the glove came directly from Williams, the evidence suggests that this glove was more likely used by him as an instructor, coach or manager after his playing days. The Boston Globe published a photo of Williams wearing his last glove on the field during his last game (left). Williams continued with the Red Sox as an instructor in 1961 (center) and used other gloves when he instructed players in his role as a coach and as a manager with the Washington Senators (right). The date issue is also notable because Pressman wasn’t even living in Boston at the time Williams retired. He was attending medical school at Columbia University in New York City from 1958 through 1961. Considering his claims of having a close relationship with Willaims and Esken’s story that he was able to choose which glove he wanted as a gift, it would appear that this would be more difficult to do while living in Manhattan in 1960. The glove sold on Friday night for $88,157. Someone out there thought it was at least worth that, but can the winning bidder ever really know for sure it was used by Ted Williams in 1960? It’s a sad state when the fraudulent authentication of an item is a forgery too! Esken’s credibility has been shredded many times. It seems all anyone has to do is advertise themselves as experts on a specific topic and this hobby will run to give them business. It’s simply not credible that Wilson would have made a new logo for a single glove in 1960. Is it possible Williams used this glove as manager of the Senators 1969-71? That makes more sense to me. Another fool bidder got takedn by the crooks out of his hard or maybe not so hard earned $$$$$ ,s.
Is there any credibility left in PSA/DNA? I’ll bet you dollars to “Donitz” there isn’t. Excellent article as usual. You support your contentions with photos and let the reader make up his own mind. My compliments. Psa had access to every baseball card from the 1960’s, and seemingly didn’t check photos? More photo detective work seems to have been done here than PSA was willing to do? Instead, hearsay and a 20 year old story with no confirmation and no way to verify was the major piece of so called ‘evidence’ that PSA relied on? Just exactly where exactly is the authentication part of the COA? Didn’t they start authentication services to use solid proof to combat the simple “He said, She said” provenance or backstories? What is the difference between Esken’s backstory and anyone elses? Shouldn’t they have higher standards in order for an item to get a COA? PSA/DNA, REA, and the rest of the crooks who have made an industry out of fleecing memorabilia buyers are a bunch of question beggars. In the philosophical realm, “begging the question” is a logical fallacy in which the veracity of a statement is based only on its own unproven premise: “That glove has to be the last one Ted Williams used because I got it from someone who told me it is.” It’s not laziness or incompetence that prevents these question beggars from doing even a minimal amount research, as Peter Nash does so diligently, that might cast doubt on the authenticity of the items they offer for auction; rather, it’s an inclination towards outright, active chicanery and cheating. That’s just what they do. And it’s a sad blot on a thriving industry and the beautiful game whose history is so callously disregarded and rewritten in order to further their slimy plots to dupe trusting customers out of as much money as possible. By selling all these fakes and forgeries, they have sold their souls, and begging the question is all they have left now. Thankfully, we have intrepid investigators like Peter Nash to keep reminding us of that, as painful as the knowledge may be. It is ironic how the article ends up telling about Billy Crystal buying Mickeys first base glove for around $ 260. G,s,when in fact it was a worthless piece of leather,seeing as the manufacturer stated that the glove in question wasn’t made until after Mickey retired.So, you see, these thieves have been in existence for quite some time.They all should be locked up, cause they are no different then a crook being caught red handed robbing a store ,etc.They like to give themselves fancy tittles ,when in fact they are nothing but down and out thieves robbing John Q.
Dennis Esken contacted us and wanted to point out that although we said the Williams glove in the Goldin auction was identical to the glove illustrated in the 1966 Wilson catalog, he states that the oval Wilson logo on the wrist strap is positioned in a different spot on the glove and the illustration. In the illustration the “W” logo appears a bit further to the right. In a previous interview Dennis also did point out that illustrations in catalogs didn’t always reflect exactly what a glove actually looked like on the field. We felt that the 1966 glove in the catalog had all of the same graphics and glove design components as the Williams glove which contrasted the gloves issued in the years from 1960-1966. But in the illustration the logo does appear closer to the right of the strap. Peter, you said “identical.” Please let your readers know that Ted Williams was Wilson’s’ poster boy! He wasn’t just another player on a baseball card! He also signed with Sears after the 1960 season to endorse his own line of sporting equipment. So buy 1964 he had his own line of gloves which even included his own personnel model! So why then when he was a coach or manager wasn’t he using his own products? I guess he just went down to his local sporting goods store to buy the new 1966 A 2000 model to use since he just liked it more this his own line? Before people make posts they should learn a little more about baseball gloves! Manufacturers do make gloves for their number 1 endorser well before they offer them to retail! It’s not so much the microscopic variances in gloves from the 1960s that is at issue here, it’s the carelessness and deviousness that characterizes the authentication process. Accepting a glove from someone whose best proof of authenticity is an unproven claim, then turning around and passing it off as authentically game-used by a particular player is careless at best and criminal at worst. Knowing what he now does about the questionable history of this glove, is Mr. Esken still willing to stake his professional reputation on the fact that it is indeed the last glove used by Ted Williams? He can dig in his heels and defend his identification of the glove all he wants, but the fact that there was ANY question about the veracity of the “last game-used” claim should have factored into its description by the auction house before the bidding started – and according to the auctioneer, it wasn’t. It was more important to amplify and exaggerate its history in order to pump up the price than to admit that there was plenty of room for doubt about the claim of its being the last game-used glove of Williams’ career. Whether there was a six month or six year time lag between the time the glove was first manufactured as a prototype and the time it appeared on the market hardly matters; it’s the shoddy, corrupt practices engaged in by authenticators who claim to know what they’re talking about, but in reality are just guessing half the time and deliberately lying the other half that is so disturbing and disheartening to those of us who love the game of baseball in all its flawed, imperfect glory. You should really dig a little deeper on Dr Pressman. He’s been selling bad game usedd stuff for years. Did Esken tell you that? Taube probably even knows about his bad Ted W bats too. About Mr. Esken’s comments above: as I am sure you know, atheletes don’t always use the products they endorse: look into the history of the clubs Tiger Woods has used, for example. So, post-1960, did Ted Williams use a cheap Sears glove? I doubt it. Does anyone have any evidence he did? Pictures? When Wilson custom-made gloves for their big customers, which you intimate the “last glove” was for Williams, did they still stamp them with model numbers, and give them all the markings of store-bought gloves? That seems unlikely to me. And wouldn’t this glove have some imperfections in spacing, stitching, etc.? That said, search in Google for pictures of President Johnson throwing out the first pitch in 1964. His glove has a round W logo. Who knows? Goldin should have let Ted Taylor authenticate it. He is above suspicion.